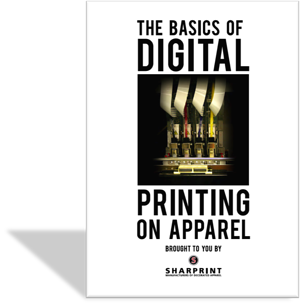 Digital printing or direct-to-garment (a.k.a. DTG) printing has arrived! We’ve been watching this industry for years and at last the digital print technology has reached our quality standards for art reproduction on dark garments. The color separation, set up times and number of colors involved made printing complex and/or photographic imagery on darks very cost prohibitive. Rush charges made quick turns for small runs very expensive. DTG makes simulated process prints WITH a quick turn possible and affordable because the art file is printed directly onto the apparel item being decorated using ink jet technology, similar to a home or office paper printer. As with screen print and embroidery, we review each piece of art for good print capabilities before even beginning proofing. The submission guidelines for digital printing are a little more lenient than with screen printing, but the golden rule remains - good art makes good prints. In this step we communicate what the final print will look like. Size - location, etc. We’ll give you a heads up about any potential problems, advise on solutions, and when everything meets your approval, pull the trigger. This happens behind the scenes. Our artists boost the design, sharpen the detail, and format the file so the digital printer can produce a print as true to the original as possible. Pre-treatment is needed on dark garments only. The pre-treatment is a spray primer for the white under base print on a digital printer. The garment is heat pressed to seal the primer prior to printing. Just like an office ink jet printer, heads containing ink jets move back and forth over the print substrate spraying CMYK to recreate the digital image. DTG printers have additional white jets to create an under base, then print the color image. There is a second curing step to complete the process. Just as screen printed tees are cured, the garment is placed on a conveyor belt that runs through a very high temperature dryer to set the ink. Your printed apparel is boxed up and staged for pick up or shipping! Although DTG printing is just as good - perhaps more detailed - than screen print, each medium has a unique quality. For this reason, digital prints should never be used as pre-production samples no matter what the time and cost restraints are. The pre-treatment on dark shirts may leave a slight discoloration around the printed image area. This is a natural result of the process and disappears with the first wash. All DTG prints should be washed prior to wear. To best preserve the colors in your design, we recommend washing the garments inside out in cold water. Direct-to-garment printing produces the best results on 100% cotton garments. Polyester thread has a finish that repels the printer inks. Some blends can work, but your best bet is to stick with 100% cotton. Garments with finishes - such as stain resistant aprons - are not able to be printed digitally.